On the Other Side of the Ugly Stage… at last! I wrote about this piece a few weeks ago when it was in an early stage of development and when it was – well, ugly seems harsh, but definitely not working for me. Some pieces seem to fly together. This one has not. But, I completed almost all the surface design this afternoon and I’m pleased at how it has come together. At last! Phew! Some lessons. First, a work may not go in the direction you originally envisioned. In this one, it changed from being all about the twigs. That’s what drew me to the reference photo. Those were the patterns I wanted to explore. But, when I had laid down the first stencil layer of twigs and branches, the pattern seemed awkward, not fascinating. But, second lesson, auxiliary ideas may arise. For awhile, I left the twigs to let them simmer, and worked on other more abstract branch shapes. Some are straight, some have a gentle curve. They are definitely graphic elements, not pictures of twigs. But I like them a lot. I like that the piece is big enough that I could play with positive and negative variations with this linear pattern. Third lesson – hold on to the things that you like and seem to be working. I have been very drawn to this teal and purple palette. I like the fabrics I printed. It seemed to me there was something good in there that should work. So, I hung in with the project. Fourth lesson – scale. I had originally drawn this composition with just two small birds. But, even though finding the birds among the twigs and branches was part of what interested me from the get-go (in other words, I did not want giant-sized immediately obvious birds) two birds in this space just got too lost. So I added more. There are now five birds. And as I added more, lesson two – auxiliary ideas – came into play. 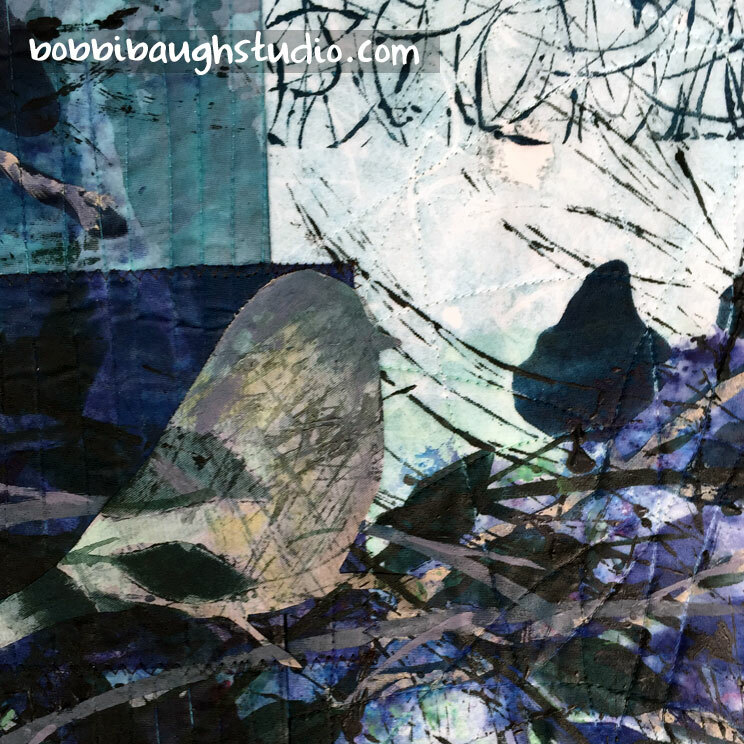 The positioning of the birds implied an overall arc through the quilt. 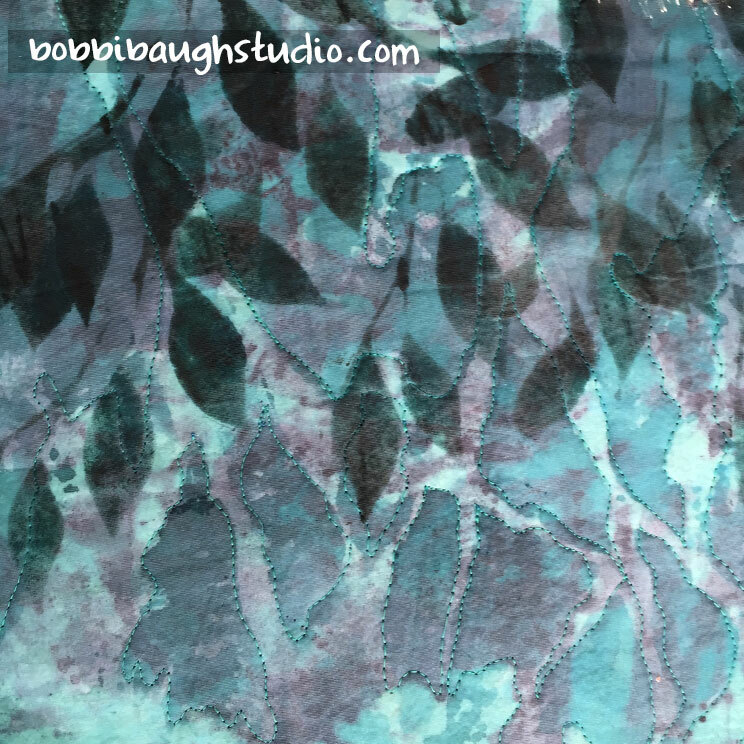 This became the composition solution I was looking for, as I developed up a pattern of foliage.Almost done. I need to stitch a few sections for texture. (Previously learned lesson: Don’t sew the same day you collage. Wet glue is generally not like by your sewing machine.) Once it’s bound I’ll be able to look for final details that may need a little paint tweak or two. I’m glad I stayed with it. I’m glad I have a piece I like. I’m glad they are not all this hard!